Bank stocks tanked on Friday after several banks released their Q1 earnings reports. The S&P banks index fell 2.6%, with J.P. Morgan Chase (JPM) and Wells Fargo (WFC) falling 2.7% and 3.4%, respectively. This came as a surprise to many investors, as all of the banks that released earnings either matched or beat EPS expectations. However, the top line was far less stellar than the bottom line; mortgage revenue fell for J.P. Morgan and Wells Fargo, trading was lackluster at Citigroup, and revenue and deposits declined at PNC. The U.S. in conjunction with the U.K. and France, launched over a hundred missiles at chemical weapons sites in Syria. In the first coordinated attack against Bashar al-Assad’s regime, the West targeted three chemical weapons facilities in and around the Syrian capital of Damascus. The attacks came in response to an alleged chlorine attack in the city of Douma by the Syrian regime. While U.N. Ambassador Nikki Haley said that the U.S. remains “locked and loaded” to strike should Assad use chemical weapons again, Russian President Vladimir Putin warned that further attacks would lead to “chaos” in international affairs. In Congress, a number of Democrats and Republicans have said that any further attacks would require congressional authorization first. Oil prices rose to a three-year high amid OPEC supply cuts, surging demand, and geopolitical instability. West Texas Intermediate (WTI) and Brent crude rose to their highest levels since 2014, spiking on Wednesday after the President told Russia to “Get ready” for a U.S. missile attack on Syria (though oil prices fell slightly after Monday trading began in Asia). While geopolitical tensions in Iraq, Yemen, and Syria have contributed to oil’s upward drift, OPEC oil production cuts have also helped, with output in March falling to its lowest level in 11 months. Additionally, a report from the Oxford Institute for Energy Studies found that strong demand from a booming world economy was the most important contributing factor. President Trump announced that the administration is looking into reentering the Trans-Pacific Partnership. Several lawmakers told the media that Trump has asked U.S. Trade Representative Robert Lighthizer and National Economic Council Director Larry Kudlow to look into the possibility rejoining the trade agreement. The President pulled out the TPP just days after taking office, calling it a “disaster,” but in light of the ongoing trade conflict with China, sees it as a way to put pressure on China. However, the agreement was already signed by 11 nations earlier this year, and many have brushed aside Trump’s hopes to renegotiate it. Facebook co-founder and CEO Mark Zuckerberg made his first testimonial appearances before Congress last week. In two appearances before committees in both the House and the Senate, Zuckerberg answered questions from lawmakers for nearly ten hours, apologizing publicly for the recent scandal involving Cambridge Analytica. While Zuckerberg was more frustrated during his second day of congressional testimony, most viewed his testimony positively, with Facebook’s stock soaring almost 7% at one point in the week. US benchmarks fared well for most of the week before sinking on Friday. The Dow Jones Industrial Average (DJIA) finished up 1.8% for the week, the Nasdaq Composite (COMP) closed up 2.8%, and the S&P 500 (SPX) finished up 2.0%. European benchmarks had about as strong of a week. 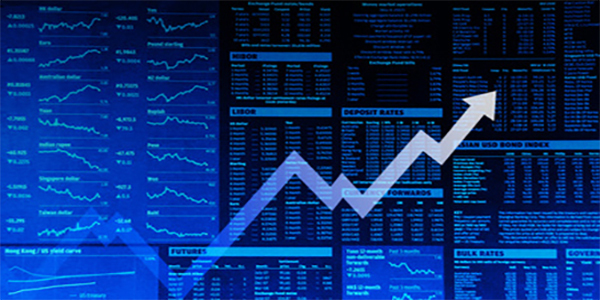 The UK’s FTSE 100 Index (FTSE) finished up 1.2%, and the German DAX Index (DAX) closed up 1.7%. Asian markets did as well as their American and European counterparts. Japan’s Nikkei 225 finished up 0.9%. India’s BSE Sensex finished up 1.5% and Hong Kong’s Hang Seng closed up 2.4%. Investors are starting to look at more than just the bottom line. Q1 earnings season was supposed to be a shoe-in for higher stock prices. Since 2013, 80% of S&P 500 gains came during earnings seasons (i.e., the periods during which companies report quarterly earnings), and analysts expected a 17% year-over-year rise in income for companies in the S&P 500 in Q1 of 2018, thanks in large part to the Republican tax bill. However, even after several banks beat earnings expectations for Q1, bank stocks, and markets more broadly, plunged on Friday. The 12-month forward price-to-earnings (PE) ratio has sunk from 18.5 to 16 since January, reflecting waning investor optimism in the now nine-year old bull market. The intensified scrutiny of fundamentals meant that banks couldn’t hide glaring deficiencies in their top line; loan revenue barely grew at J.P. Morgan in spite of a surging economy and the Trump tax cuts. Additionally, while conventional wisdom says that higher interest rates lead to greater profits for banks, that hasn’t been the case, at least in the past several months. Finally, in light of the intense volatility in the market for the past couple months, many expected big trading profits, but bond trading, which accounts for significantly more revenue than equity trading, was mediocre at best. A number of other macroeconomic factors have started to weigh on markets. Participants at the Fed’s March FOMC meeting discussed the need to pump the brakes on the U.S. economy, amidst a huge federal spending spree. Inflation has also become a growing concern, with the CPI rising 2.4% year-over-year in March. While Trump’s consideration of rejoining the TPP may put a short-term damper on fears of a global trade war, the potential for a full-blown trade war between the U.S. and China remains high. As a result, investors are beginning to pay much closer attention to the fundamentals, which means that momentum buying is no longer going to be a substitute for due diligence. Growing geopolitical uncertainty will affect day-to-day market movements, but not the long run. Last week saw political turmoil both here at home and abroad. Last Monday, the FBI raided the office of President Trump’s personal lawyer Michael Cohen, seizing everything from business records to computers, and the President labelled the raid as “disgraceful.” The New York Times also reported that the President had sought to fire special counsel Robert Mueller back in December, and White House Press Secretary Sarah Sanders told reporters that Trump believes he has the power to fire Mueller. McClatchy DC even reported that Cohen was in Prague at the height of the 2016 presidential campaign, confirming part of the Steele dossier, which alleges that Cohen’s trip there was to meet with high-ranking Kremlin officials. On the international stage, things didn’t fare much better. The U.S. missile strikes in Syria marked the first significant escalation of the conflict in Syria since last year, when Trump ordered missile strikes against a Syrian airbase near Homs. Russia, a staunch ally of the Assad regime, condemned the attack and attempted to pass a resolution at the UN Security Council with the same message (which was soundly rejected, though China also voted in favor of it). Yet in spite of these developments, markets had a solid week. For those who have been following markets closely over the past year, this shouldn’t come as a surprise; markets have been very quick to bounce back from temporary drops from political turmoil in Washington. Even otherwise, markets have historically rebounded quickly from crises; on average, the Dow has gained 6% in the 12 months following a major geopolitical crisis. So while geopolitical risk may make day traders skittish, investors who are in it for the long haul will largely be unaffected. Zuckerberg managed to stave off regulation of Facebook – for now. Facebook’s CEO may have become a meme thanks to his congressional testimony, but he may have also kept regulators away from big tech companies, at least in the short run. Prior to last week, the chorus of calls for increased regulation of Facebook was deafening, and while a number of both Democrats and Republicans remain committed to that, Zuckerberg exposed just how little many lawmakers know about social media and the Internet. 84-year old Senator Orrin Hatch apparently had no idea how Facebook made money, to which Zuckerberg replied, “Senator, we run ads,” drawing laughter from the audience. Even the younger Senator Brian Schatz was puzzled about the difference between text messages and emails. For a Congress that hopes to crack down on tech giants like Google and Facebook, understanding how the Internet works might be a good start. However, even in the face of basic questions, Zuckerberg remained calm and conciliatory, unlike Bill Gates, whose belligerent 1998 testimony before Congress led to a an antitrust crackdown on Microsoft. In the long run, it’s likely that Congress will more closely regulate the Wild West that is social media, but for now, it seems that Facebook has gotten away scot-free. Featured image courtesy of Trading and Investment News.